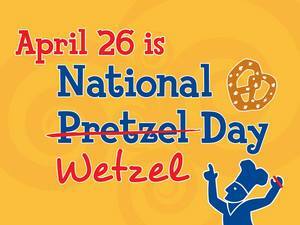 PASADENA, CA--(Marketwired - Apr 14, 2015) - In honor of National Pretzel Day on April 26, Wetzel's Pretzels, the innovator in super-premium, hot and fresh pretzels, will host its first ever "National Wetzel Day," with FREE pretzels offered to those with the last name Wetzel. Not a Wetzel? Not a problem. Customers can become one -- temporarily! Guests can simply visit their local Wetzel's Pretzels and say "My name is (guests' first name) Wetzel, and I'd like my free pretzel!" Akin to knighthood, the opportunity to become a Wetzel for a day is an ultra-exclusive opportunity, and guests are encouraged to invite family and friends to a local store to enjoy a hot and fresh twisted treat, while connecting on Facebook, Twitter and Instagram with their newly-acquired Wetzel's family by using the hashtag, #NationalWetzelDay. "This year, we're bringing our customers into the fold to celebrate National Wetzel Day and rewarding them with complimentary twisted goodness," says Bill Phelps, CEO and co-founder of Wetzel's Pretzels "Because if you're going to change your name, you should at least get a free pretzel out of it." 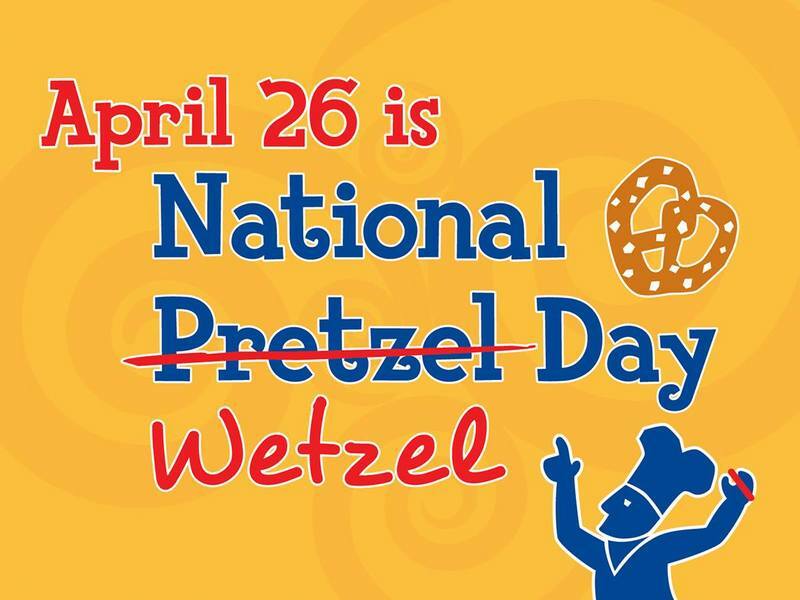 For more information, visit www.wetzels.com, and follow along on Facebook, Twitter and Instagram @ wetzelpretzels for fresh-twisted treats. Armed with a vision and a tasty recipe for soft pretzel perfection, Bill Phelps and Rick Wetzel opened the first Wetzel's Pretzels bakery in Redondo Beach, Calif., in 1994. Long lines of hungry customers soon formed, attracted by mouth-watering soft pretzels that were hand-rolled, baked fresh and served hot from the oven. As word spread about these golden-on-the-outside pretzels, the company added additional offerings to its menu. Today, Wetzel's Pretzels has grown to more than 300 fresh bakeries across the United States and around the world, including premier locations at Disneyland and Walt Disney World. Every Wetzel's Pretzels bakery adheres to the original vision of its founders; that each super-premium pretzel will be crafted from fresh dough and baked in-store consistently throughout the day, to ensure a delicious offering for each consumer, regardless of when the craving for a pretzel strikes. For additional information on Wetzel's Pretzels or franchise opportunities, please visit the website, call (626) 432-6900, "Like" them on Facebook and follow them on Twitter.